Oxy-fuel Combustion: Fundamentals, Theory and Practice provides a comprehensive review of various aspects of oxy-fuel combustion technology, including its concept, fundamental theory, pilot practice, large-scale feasibility studies and related practical issues, such as the commissioning and operation of an oxy-fuel combustion plant. Oxy-fuel combustion, as the most practical large-scale carbon capture power generation technology, has attracted significant attention in the past two decades. 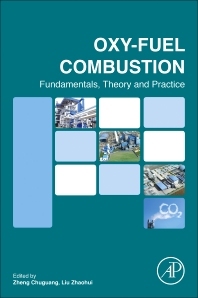 As significant progress has been achieved in worldwide demonstration and the oxy-combustion concept confirmed by Schwartze Pump, CUIDEN, Callide, Ponferrada and Yingcheng projects in the past five years, this book provides a timely addition for discussion and study. Zheng Chuguang is a member at the State Key Laboratory of Coal Combustion, Huazhong University of Science and Technology, Wuhan, China. He has coordinated several national level oxy-fuel combustion related projects, leading to successful implementation and scaling up of oxy-fuel combustion technology from 0.3MW ,3MW, to 35MW in China; as well as completing the feasibility study of the 200 MWe full scale oxy-fuel demonstration. He has enhanced the understanding of fundamental research, key technology R&D and industrial demonstration of oxy-fuel combustion, and have produced more than 40 peer-reviewed journal articles and 20 patents. Liu Zhaohui is a member at the State Key Laboratory of Coal Combustion, Huazhong University of Science and Technology, Wuhan, China. He has coordinated several national level oxy-fuel combustion related projects, leading to successful implementation and scaling up of oxy-fuel combustion technology from 0.3MW ,3MW, to 35MW in China; as well as completing the feasibility study of the 200 MWe full scale oxy-fuel demonstration. He has enhanced the understanding of fundamental research, key technology R&D and industrial demonstration of oxy-fuel combustion, and have produced more than 40 peer-reviewed journal articles and 20 patents.